Pens Fatales: Le Baiser and Happy Valentine's Day! Happy Valentine's Day to all our Pens Pals!! In my college years I was very lucky to be able to spend a summer in France and studying at the University of Dijon. It was a memorable trip for many reasons, but one of the most thrilling aspects of going to France (besides the food and wine) was the art. As I've mentioned before, I'm a frustrated artist. I love the nuances of color, and shadow, and light that play in paintings. I was especially drawn to the Impressionist paintings and was happy to spend an afternoon at the Louvre in the presence of famous canvases. I was in awe. And then I went to Rodin's museum. I knew about The Thinker, his oh-so-famous statue, but beyond that I wasn't well-versed in Rodin's work. The sculptures are displayed throughout the house and gardens of the Musee Rodin and it is beautiful. If you are ever in Paris, I highly recommend taking the time to visit. 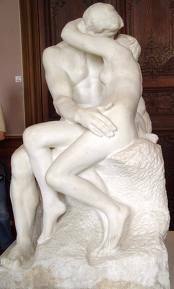 At the museum I was introduced to Le Baiser (aka The Kiss). Romance writers tend to be a little starry-eyed, a little romantic, and a little susceptible to passion in its various forms. This intimate glimpse of a couple kissing tripped all my romance buttons. Hope you enjoy! As a Valentine's treat, my latest release, BETRAYALS, is available at Amazon for FREE today and tomorrow. I love that statue.... so much in it. Gorgeous. My mother was in Europe shortly before she and my father were married. She saw The Kiss and sent him a postcard of it writing "This is the sexiest thing I have ever seen." He still has the postcard 38 years later.